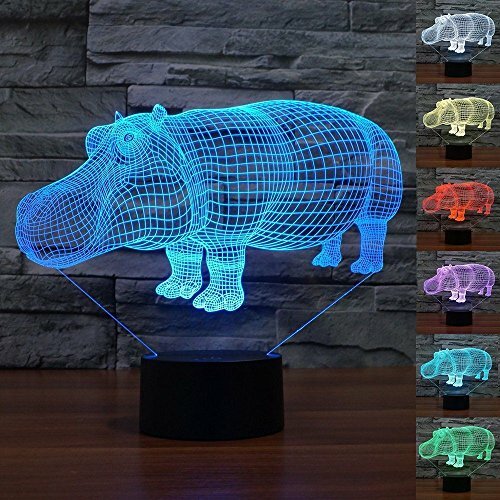 3D Illusion Night Light Animal Hippo Night Light 7 Color Change LED Table Desk Lamp Acrylic Flat ABS Base USB Charger Home Decoration Toy Brithday Xmas Kid Children Gift by FXUS at Animal Backgrounds. Hurry! Limited time offer. Offer valid only while supplies last. Description: 3D vision effect, especially in the dark or take a photograph,PMMA acrylic is not glass, the whole board is solid acrylic material. Smart Touch button : to change the color by press the button, press it first the lamp light up, and press it again will change to another light. Flash color changing mode. Press the touch button to last color,auto color changing mode works. 100% RISK-FREE SATISFACTION GUARANTEE,If for any reason you are not satisfied with your purchase, please contact us. Our side commitment to you will make things right! promise you to confident your buying. If you have any questions about this product by FXUS, contact us by completing and submitting the form below. If you are looking for a specif part number, please include it with your message.